A Sign of Something Else? associated with males]," said one woman. Others were not quite as amused. spoils the architectural flow for everyone. 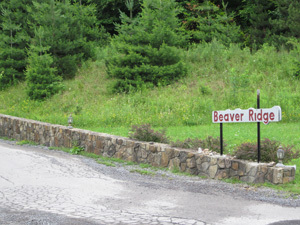 Prior to the consolidation of power in 2006, Beaver Ridge owners and guests enjoyed the benefit of a lighted entrance sign tastefully placed along Route 32. However, the inability of the current president to get along with different neighbors on either side of the entrance quickly changed the situation. For years the association has had no sign at all. 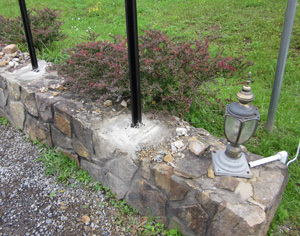 Rather than working with others to come up with a mature solution that works in the interest of all parties, the Beaver Ridge board shocked neighbors by unilaterally drilling into the stone wall along the common entrance, forever marring the natural look for everyone in order to erect a cartoonish sign next to the mounted lights. Ironically, of the five communities which share the entrance, Beaver Ridge is the only one that has steadfastly refused to pay for road repairs and plowing (for nine years running, according to neighbors). The board has gone to great lengths to avoid paying even for the electricity that "lights" their sign. Some owners support the board's argument that taking from others serves the financial interest of the association. After all, someone has to pay to have the road plowed. Pushing off the necessary maintenance burden onto neighbors is said to have saved Beaver Ridge at least $13,000 since 2004.
along a road the board refuses to maintain. But not all owners share the personal values of board members. A minority believe that it is unethical to live off the work of others and are embarrassed to be part of a community that does not pay for what it uses: "There's a name for people who expect someone else to pay their bills", says one, "they're called 'children'."